Home » Interesting Discussions » Simple Blogging Tips: Should you use a mobile theme for your blog? Simple Blogging Tips: Should you use a mobile theme for your blog? With mobile phones turning into mini computers in our hands, it is not surprising that more and more people are surfing the web on the go. The fact therefore, is that more and more people are reading blogs while on the go. I personally don’t on my mobile but I do so on a tablet sometimes. For bloggers, there is this universal wave to push blogs to display mobile themes or a mobile friendly version of our blogs to those who browse from a portable device. The pros say we should, because it loads faster and is easier to read. There are a few ways you can do it, from the complex (setting up a mirror site with mobile capabilities) to the simple (installing a plugin). If you use the WordPress.com and Blogger free platforms, its already done for you or you can switch it on in the settings (one of that). But really, do you need it and should you use a mobile theme for your blog? 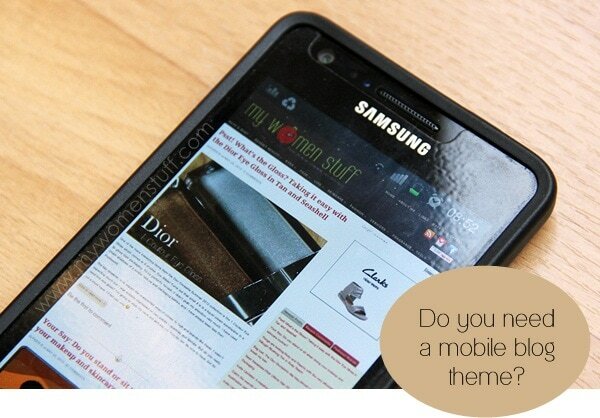 For readers, do you prefer that a blog have a mobile theme when you read it on your mobile device? I’m going to buck the trend here and say no, you do not. For me, if a blog or website has a good and easy on the eye layout, its mobile friendly as it stands. If it loads easily on your computer, it should load just as easily and quickly on your mobile. These are the 2 reasons why most people use a mobile blog theme – speed and ease of reading. Mobile themes usually strip away all the hard work you put into your web design and if truth be told, makes every site look pretty generic. If I wanted that, I’d not bother with my blog theme. If you browse around many websites and blogs built on the WordPress platform, you will notice this. Most blogs and websites on the WordPress platform use the WPTouch plugin which is great for turning websites/blogs mobile but which in the process, makes them all look the same, unless the blog owner took some trouble to tweak the design. My other reason for not going with a mobile theme for my blog is not because I think my layout is optimum or perfect. It isn’t and more work could be put into it. But it is pure and simple fear. A year or so back, I jumped on the mobile theme bandwagon. I used a plugin – WordPress Mobile Pack – and it worked. I had a desktop and mobile version of my blog and it didn’t look like the generic WPTouch design. I thought it was perfect until one day, I checked my blog for errors and noticed more than a THOUSAND blog errors. Every page had random additional code tagged on, which resulted in the crawlers seeing 404 error pages and this number was replicating by the hundreds even as I watched. It was a nightmare. I found no help online, so I devised my own codes, uninstalled the plugin and managed to contain most of the problem. I’m still seeing those errors today and it is a grim reminder of how my blog very nearly bit the dust, thanks to rogue code and a vain attempt to please the masses and jump on a bandwagon I probably had no business jumping on. I’m not saying that having a mobile theme is a bad thing of course. It is great. It loads up quickly on a mobile phone and looks clean and neat. I am sometimes surprised when I click to the web version of a blog, to see that their original website is sometimes impossible to read. The mobile theme is good for keeping the mess away and the blog simple so content gets across. That is not an excuse for a cluttered web design of course. No rights or wrongs, just how you want to do your thing. Simple Blogging Tips are some simple tips I have for fellow bloggers, based on my own experiences. I’m no ‘guru’ but I hope they will help you. You may read up on previous Simple Blogging Tips here. 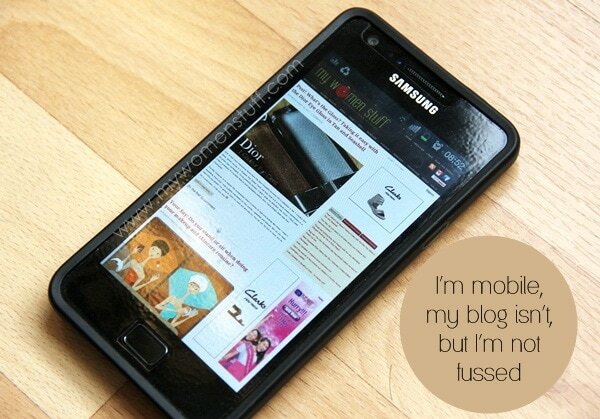 Personally, it doesn’t really bother me that much whether a blog has a mobile theme or not. But a very small amount of blogs do get tricky to navigate on small devices, like the iPhone. I use the default WordPress mobile template. It’s not the best design, but it serves its purpose. I have to agree with you about the tricky bit so I do tend to stay away from reading blogs online. When I do, I use an RSS Reader to get the gist then click through if I’m interested 🙂 Leaving comments is a whole different matter though! Haha you complain about your 3G and I’ll complain about mine >.< The only difference is that I don't have to go underground hehe... To read blogs I usually wait till I can get wifi then I load up. Else, I just skip it unless I"m absolutely desperate e.g. when I'm googling reviews in the middle of a pharmacy LOL! I believe that mobile theme is neccessary for bloggers whose ori blog has A LOT of background photos and or widgets or animation or advertisements.. It takes te longest time to load and sometimes the phois in te content would just stop loading. I personally hate browsing that type of blog usig iPod… Which sometimes make me drop following that particular blog eventually. On a side note, I love how the mws is right now. Simple, carry a character on it’s own, Easy to browse and not swarmed by moving advert. This is great! Mine is just auto-switched by the Blogger, and will look plain on mobile. I don’t really mind actually. I don’t really mind reading any blog on mobile as long as when I enlarge, the words auto-shift to fit my screen width, so I don’t have to scroll left and right, just up-down. That said, MWS works just fine on my handphone. I’m waving my hands in the air frantically in favour of mobile themes. Much easier for me to read and comment on the go. Having said that, if the mobile theme setup screws up the website, then I wouldn’t bother with it at all. Better to read a full and functioning website on the phone than a wonky, cacat-case one. Have to agree with you re: easier to read on mobiles. Some sites aren’t made to be read on a mobile at all. And yes, I hate the swipe function on WP and Blogger. Makes me loose my place every time! I actually am not sure why a tablet is recognized as a mobile. The larger screen is meant to help make it easier to surf so most sites should render well enough on a tablet. adambeauty has a mobile theme but then that’s a commercial site. I can’t make up my mind whether I prefer the mobile or desktop version when surfing on my phone. He has both versions available. I don’t like mobile themes because I’m already used to the design and layout of the current blogs that I’m following. The mobile themes isn’t that interesting to look at since it is almost the same. I think what make a blog nice and interesting is not only the content, but the layout and ease of navigation through the blog. And since I’m using a Galaxy Note or Ipad, the screen is big enough to view the blog in it’s original theme. That’s why I prefer the original themes better that the mobile. hey Paris…thanks for all the info about this whol eissue coz since sometime I had been thinking quite hard about this. the blog when viewed as such in blogger, on ehas to scroll right and left and is particularly inconvinient 🙁 so many go for mobile design or plugins!!! I find that Blogger’s mobile version doesn’t resize the photo so there’s still scrolling to have to be done if its a big photo. But the site does load up faster in mobiles so maybe it’s a good thing too. I have a love-hate relationship with the mobile theme. I love how it become easier to read in mobile theme because I don’t have to zoom in and out, left and right to read but I hate it when the picture shown are too big sometimes when you swipe it to the left so you can have a look of the full pic, it turns to previous blog post which gets me irritated most of the time. yes I totally agree! the swiping function makes me crazy!!! most of the time I just switch to web version which is much easier for me. agree!had the same prob too.I use mobile theme but I tend to change back to web version.dilemma..
Im using the WPTouch plugin and do have some issues with it. But atm cant find anything better than that, so still have to stick with it. I dont mind the simple design that it provides. Because for me, I like things to be simple on the mobile version. Im using iphone so the screen isnt that big, but I understand those who use tablets may not like it. I already decided this from the very beginning. Its not only convenient but it also another way to attracts traffic to my blog. I had the exact same problem when I installed a mobile plugin on my blog, completely screwed it up. I can’t remember what one I used but it crashed my whole site one day and we had to go through the rigmarole of going through and turning off all the plugins to find the culprit. I’ve never bothered to install one back on there and I’m happy with that.